It took me three months to figure out why you deleted my comment regarding an article you posted online. I thought I knew at the time, but I was wrong. Here’s how it went down. You shared an article regarding agricultural practices and food safety. I saw it, and it upset me because I felt it was factually incorrect and misleading. I usually grit my teeth and scroll on when this happens, but this time it struck me at a weak moment. I commented that the article was “alarmist B.S.,” and shared another article by means of rebuttal. You pulled my comment and messaged me, saying you preferred not to respond publicly. We had a terse exchange, agreed the issue would be debated for years to come, and left it at that. And it’s bugged me ever since. So much that I spent three days researching the topic and wrote a magazine article about it. So much that three of the four columns I’ve written since were shaped by this social media collision between you and me. You’ve probably seen the cartoon of a figure sitting at a computer, responding to someone in another room who has just asked, “Aren’t you coming to bed?” Typing furiously, the figure replies, “I can’t. This is important. 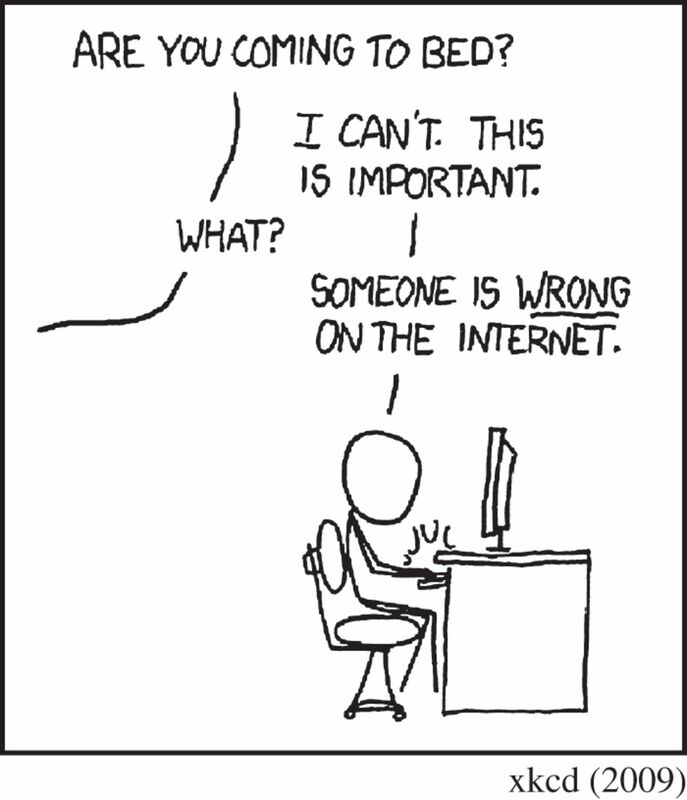 Someone is wrong on the Internet.” That’s how I felt. I had an epiphany the other day, though. All along, I thought you removed my response to your post because you didn’t want your social media friends to see a different point of view, a different set of information from what you had shared. When I responded, I felt I was addressing the article, not you. I wasn’t accusing you of “alarmist B.S.,” I was blaming the author of the article. What finally dawned on me, though, was that because you felt the content of the article was important enough to share, my response was actually an attack on you. I regret that, deeply. It shouldn’t have taken me so long to figure this out. This happens constantly in our human interactions. We form our identities around what is important to us, and assimilate information that supports what we believe. If we’re really passionate, we share what we know in the hopes of informing others. If that information collides with what someone believes, chances are they will respond emotionally. Then we respond in kind, and the conversation deteriorates from there. Pick a topic: immigration, vaccinations, pesticides, climate change, racism, veterans’ issues, GMOs. For many of us, once we’ve acquired information that fits who we are and our view of the world, nothing else matters. Not new facts, not new science, not a different point of view—unless the new information confirms what we already believe. I’m guilty of that. I’ll bet you are, too. I don’t know if I could have done anything to make our conversation end differently, or better yet, not end at all. Here’s what I wish I had done, though. I wish that before I inadvertently attacked you, I had found out what you care about. We weren’t personal friends in high school, but I was always glad when you were in my class. I thought you were smart, funny, and kind. Part of the reason our recent interaction bothered me so much is it didn’t fit with who I thought you were. I finally realized it was my fault. I attacked without giving you a chance to talk more about what is important to you, and how it influenced you to share what you did. I’ll bet if we were to explore our most deeply held convictions, we’d have a lot in common. I’ll bet we share concerns for the environment, human suffering, and more. Maybe someday we can figure out a way to re-start our conversation, with kindness and a sharing of common values first. Maybe we can stop sniping at each other and work to improve lives instead. This post appeared as the “Stray Kernels” column in the September-October 2015 issue of DeKalb County Farm Bureau’s Connections magazine.